Feeling unfulfilled? Do you dream of a lifestyle where you can have it all – good health, wealth, freedom and happiness? You’re not alone. Upgrade Your Life is your guide to taking the power back and becoming the master of your own fate and that of your business. Author Pat Divilly has worked with an array of small business owners to help them achieve a growing business based on purpose, passion and profit whilst also maintaining a healthy work-life balance. Pat offers a practical approach to setting and achieving personal and business goals, understanding that both are necessary in order to succeed in life. By promoting personal development and daily success rituals Upgrade Your Life inspires its readers to dream big and not give up in the search for fulfilment. Using the author’s own experiences, mixed in with valuable neuroscience research and popular psychology, Upgrade Your Life will help fast-track you and your business on the road to success. Everyone wants success, but not everyone achieves it. Are you living the life you want? What is the difference between those who make it and those who don't? The difference is action. Keep your dreams, but start working to make them realities. Dreams are important, but they aren't magic  you need to turn them into goals, and work every day to attain them. Bestselling author, speaker and wellness coach Pat Divilly knows what it's like to dream of success, and he knows how to attain it. By changing your outlook, your habits and your lifestyle, you can achieve success too. Dreams should not be wistful  they should be energizing, motivating, and inspiring. They are your mind's way of showing you the very best life you can have, if you are ready to listen? Upgrade Your Life is your guide to having it all, whatever that may mean to you. This book is an excellent practical guide to personal growth. Having spent the last year investing time and effort learning different personal growth strategies through books, online courses and workshops, this book is an excellent summary of all I learned. I highly recommend you start with this book and commit to the exercises, you'll definitely be in a better place by the time you finish. 5.0 out of 5 starsPat is a Star and He wants You to be One Too! Pat is an achiever and wants everyone to succeed. This book is the next best thing to spending some time with him. Bought this book after joining a very encouraging and helpfull Facebook page with Pat, and many many others all looking to live our better life. This book along with everything I've learnt from this page will definitely help to make 2017 a most enjoyable year . Can't recommend this book highly enough. I read it in 2 days and have been going back to the exercises since then. 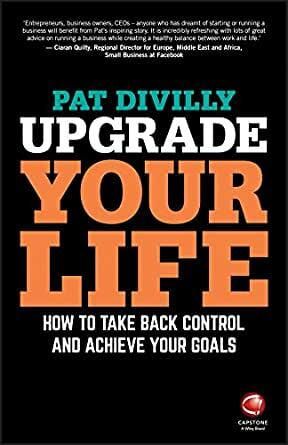 Pat has great advice and suggestions on how to upgrade your life, how to plan and takes actions to achieve your goals. I've taken part in 2 of his online courses which have made a big difference to my outlook and the way I approach my life. I'm so glad I now have this book to help me continue my journey. This book is an excellent resource to anyone who wants to live the best life they can and have help in doing so. Buy it, buy it, buy it!!! As with all pats work a simple to follow practical book that provides the reader with game-changing insights and clear methods of improving their situation in the key areas of life business health relationships finances career. A great read and the practices can be implemented Iver and over again - this is a book that you will carry with you and refer to multiple times. Top class.